Burglars are known to be opportunistic recidivists. So, being imprisoned for intruding your house does not thwart them from revisiting later. A Victim Support Survey has found that one out of four burglary victims have their homes targeted again. Practice makes perfect. If the burglar got in easily the first time, it will be even easier next time. In the event that significant steps are not taken to improve security or deal with the environment cues, such as open garages, a stuffed letterbox or an unmown lawn, this definitely invites the burglars in once more. 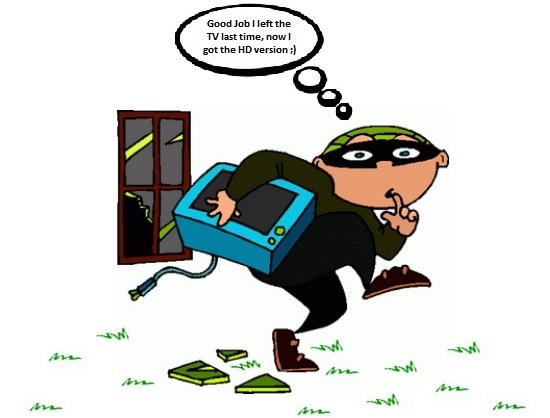 After a burglary, the first instinctive and undeniable thing you will do is replace the stolen items by brand-new ones; which the burglars know, and they would not want to miss the opportunity of laying their hands on improved versions of the items of their first break-in. During their first attempt at burglary, the burglars might have left behind valuable stuff. So, they now know precisely what is to be stolen, and where it is to be found, which makes the next theft better planned and less problematic or time consuming. Many homes tend to become victims when they are located in isolated areas. This provides an incentive to burglars as they may consider such a house as an attractive target, with least or no security at all. Some residences may be vulnerable to a repeat burglary if the burglars have a buyer for a particular item they had noticed during their initial break-in, which encourages them to make another attempt on the same house. Research found that burglars are known to “work” a neighbourhood or community on a repetitive basis, thus giving them a whole idea about your daily routines and the key to your house. Being a victim to house burglary is already enough to cause shock, exasperation and the feeling of being violated. Imagine going through that trauma once again! To avoid becoming an easy prey, ensure your property does not have a “Welcome!” sign to burglars. It is strongly recommended that you address any security shortcomings by being the least conspicuous possible, in terms of the environmental cues mentioned in the reasons outlined above. Moreover, by taking the appropriate preventive measures such as the installation of security grilles, shutters, bars and gates alongside a decent alarm and cctv system, they can definitely be a step to repel burglars, or at least deter them from revisiting. To learn more about securing your homes and businesses, please call RSG Security on 0208 123 1088.